Our Shavuot Sleepover will be held at Bet David from 4.00 p.m. on Friday, 10 May through to Saturday 11 May 2013, for Grades 10 to 12. 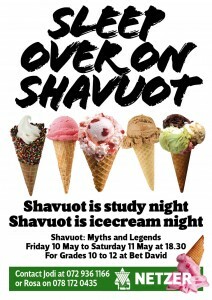 The theme is Shavuot: Myths and Legends. Ice-cream will be served. It is a mitzvah to stay up the whole night learning on Shavuot! The Shavuot Evening service will be at 6.00 p.m. on Tuesday, 14 May 2013. This will be followed by a light meal and a learning programme. Details to follow. The Morning service will be at 10.00 a.m. on Wednesday, 15 May 2013 followed by a Brocha.